Olympic motto within circle of athletes marching in pairs. 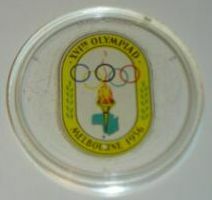 Olympic rings over Melbourne coat of arms within legend. Mr. Andor Meszaros of Melbourne, by birth a Hungarian but now a naturalized Australian, submitted the design which was accepted for both obverse and reverse of the commemorative medal. 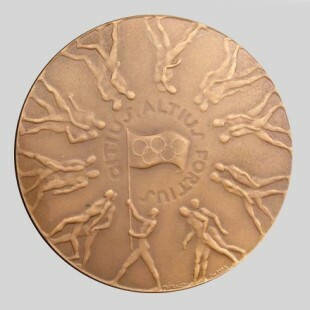 The obverse depicts in relief a design of athletes marching in pairs following a single figure bearing a banner with the Olympic device of rings and the motto of the International Olympic Committee Citius, Altius, Fortius. 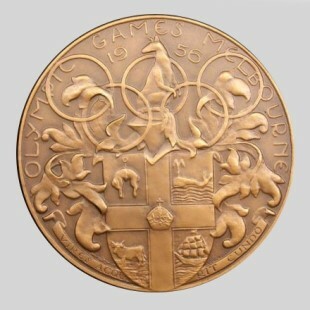 The reverse is a reproduction in relief of the Coat-of-Arms of the City of Melbourne surmounted by the five rings and bearing the inscription " Olympic Games Melbourne 1956 ". 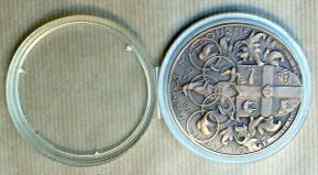 The medal is in bronze, 5/32 inch in thickness with a diameter of 2½ inches. As most of the recipients of badges were entitled also to commemorative medals, the numbers were related. Badges and commemorative medals, moreover, were distributed jointly and on the same basis ; 12,250 were struck in bronze and were issued in plastic cases. A summary of details relating to the number ordered and issued is at the end of this report.